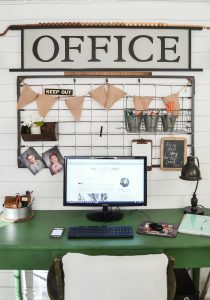 I am excited to share how we put this Repurposed Fall Wall Art together, but I am even more excited to be collaborating with so many creative bloggers in this Fall Tour. 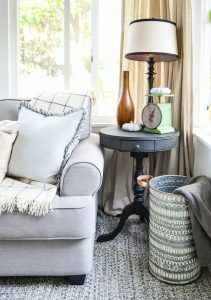 We have all come together to share beautiful fall projects that will inspire you to decorate this fall season. 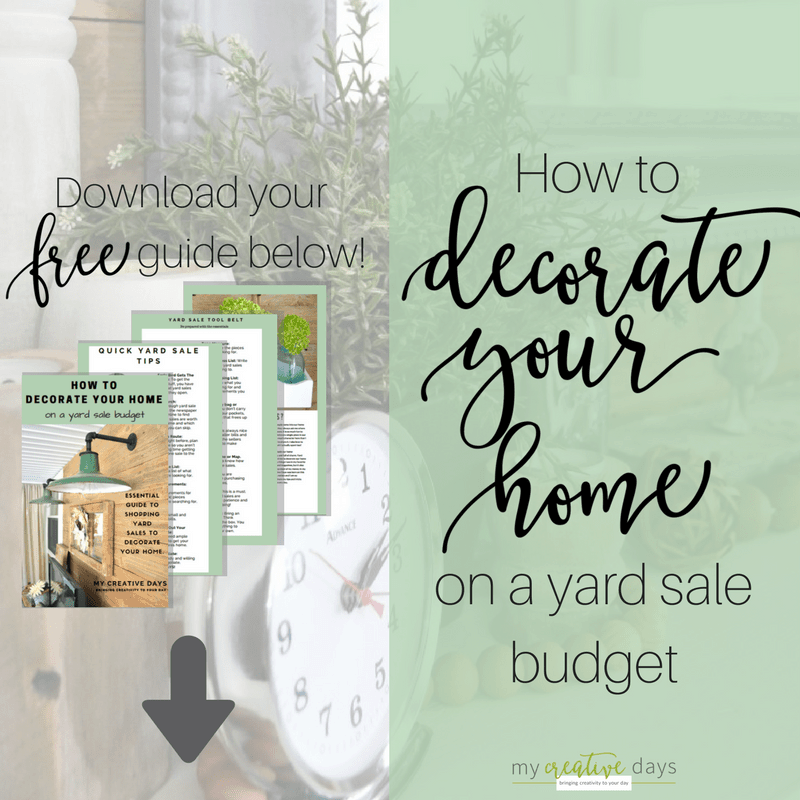 All of the fall projects are at the bottom of this post so before you get settled, I suggest you grab a blanket, your favorite fall drink and a comfy spot because you are gonna be here awhile. There is so many great ideas to see! I couldn’t be more happy with how this Repurposed Fall Wall Art came together. We used things we had on hand to put it together and it was relatively easy to do. This project started out as this pile of goodness. I grabbed a few different things I thought we would use, but then after talking it over with Matt, he made a suggestion that I didn’t even know would be possible. Initially, I wanted to use our yard stick supply behind the tubes, but we didn’t have enough to fit the entire frame. Then, Matt told me he thought he could bend the chicken feeder and I could use the metal on the back of the frame. I was super excited about that because I love galvanized metal on anything. First, Matt cut the ends off the chicken feeder with a metal blade. 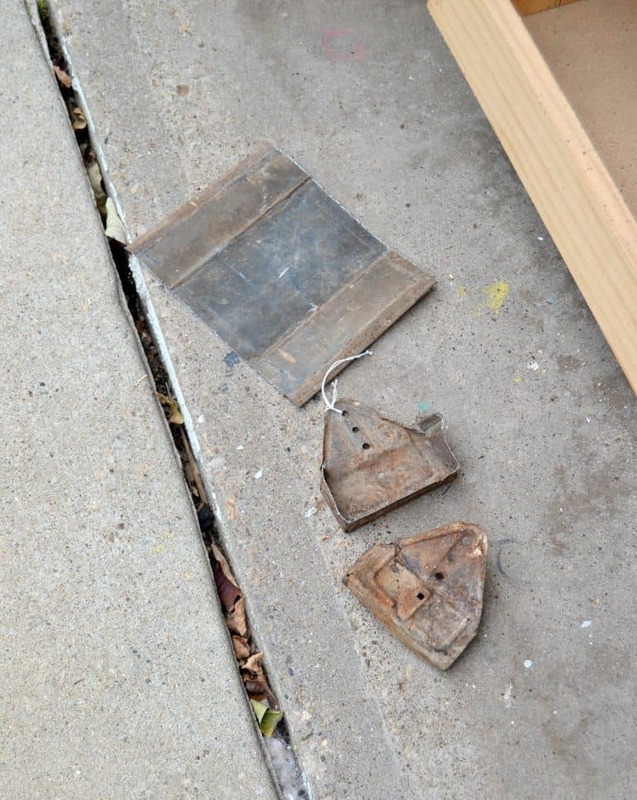 Then, he used a heavy hammer to flatten the chicken feeder. It was easy to do. 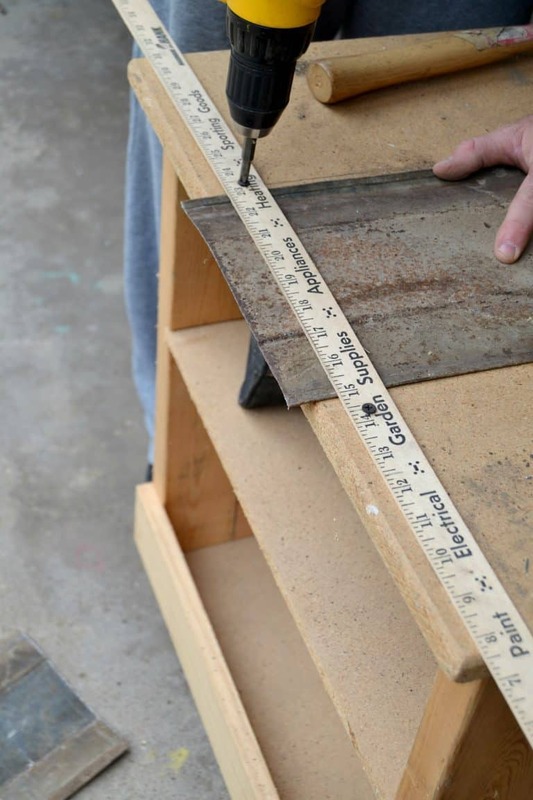 To make the hammered galvanized metal the size we needed it, Matt used a jigsaw fit with a metal blade. 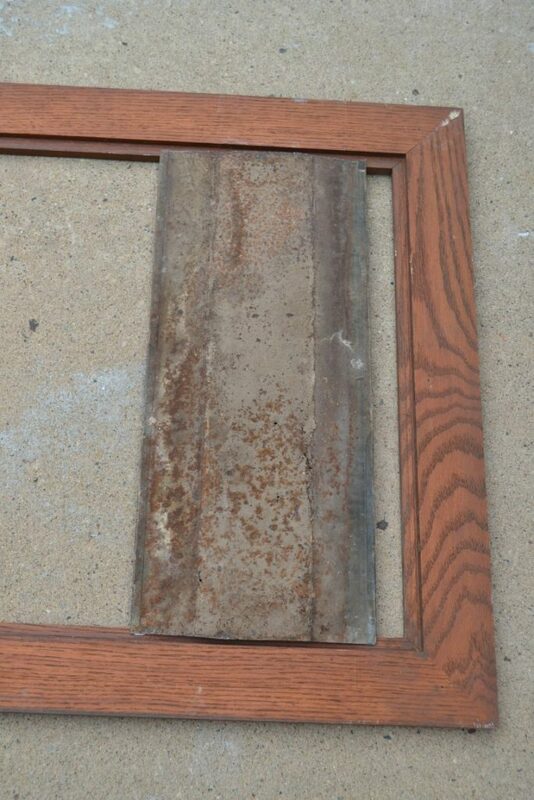 The yard stick worked great to slide the metal underneath and hold it in place. 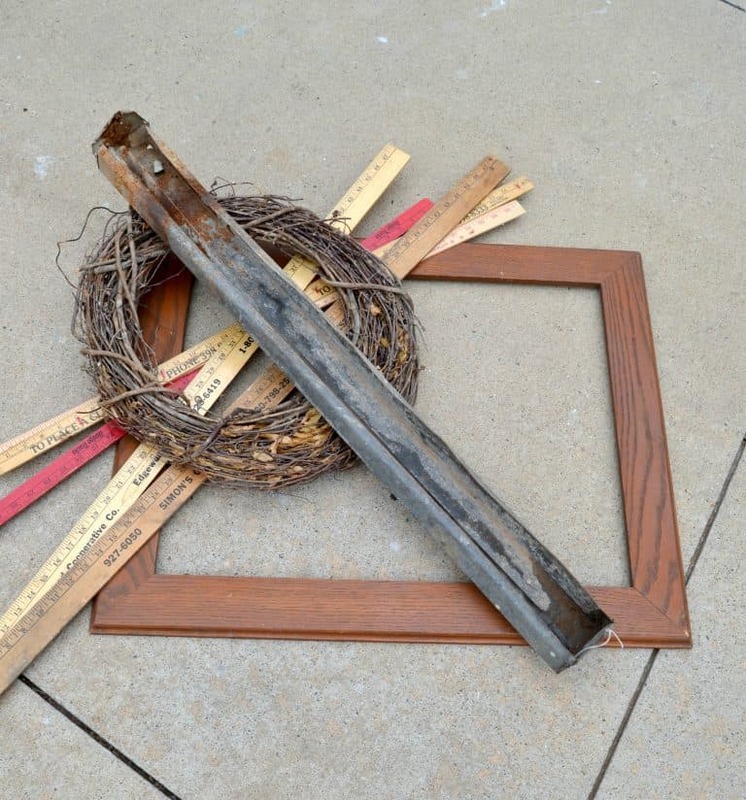 We were able to get four pieces from the flattened chicken feeder to cover the entire frame. I painted the frame gray and then sanded it down pretty well. The next addition were the “tubes” I found at a yard sale. We used metal clamps to attach them to the metal. I was going to fill the tubes with faux fall flowers and berries I had in a box, but while I was outside, these dried hydrangeas stole my heart and were the perfect fit for this project. I can’t believe how well this project turned out with only $5 invested! I hope you grabbed your blanket and favorite fall drink because now you are ready to get lost in this Fall Inspired Wonderland. Head over to Hometalk to see all the projects as well! I love how this project evolved-into perfection! It really is awesome!! Thanks Lucy! I am so happy with how it turned out. 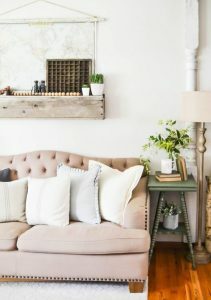 I absolutely LOVE this – pinning! Ohhh Lindsay… I’m so head over heels in LOVE with this! 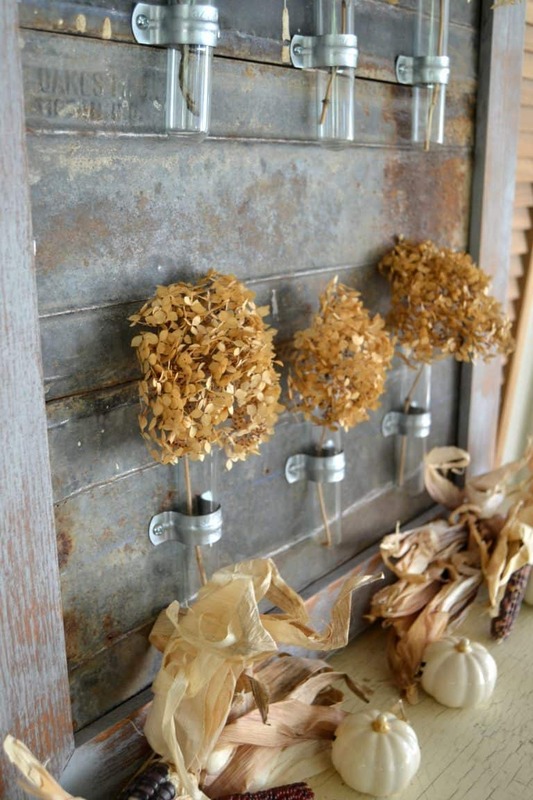 The metal with wood with glass with dried hydrangeas…. gah!!! Everything I love. You just nailed this. It’s so beautiful! 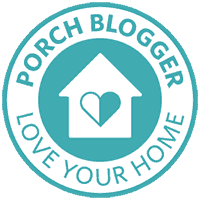 Thanks for joining the blog hop! This was a real junk treat! Thank you so much Donna! You made my day! What a great DIY! 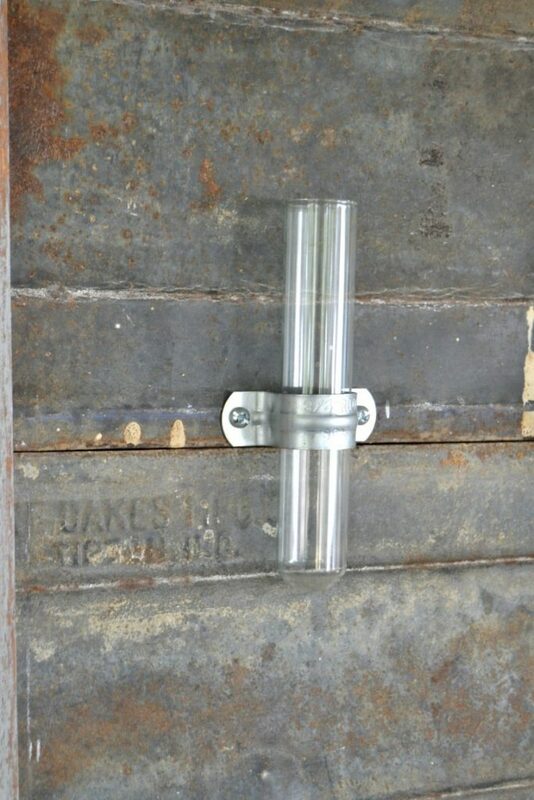 I love this idea and the rusty metal is awesome. What a beautiful piece! I love how it turned out. 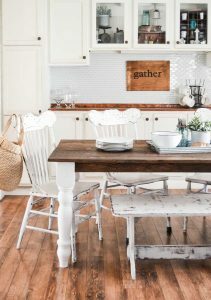 I saw this project in the HomeTalk email this morning! Also, I can’t believe you found those tubes at a garage sale!! Gorgeous! 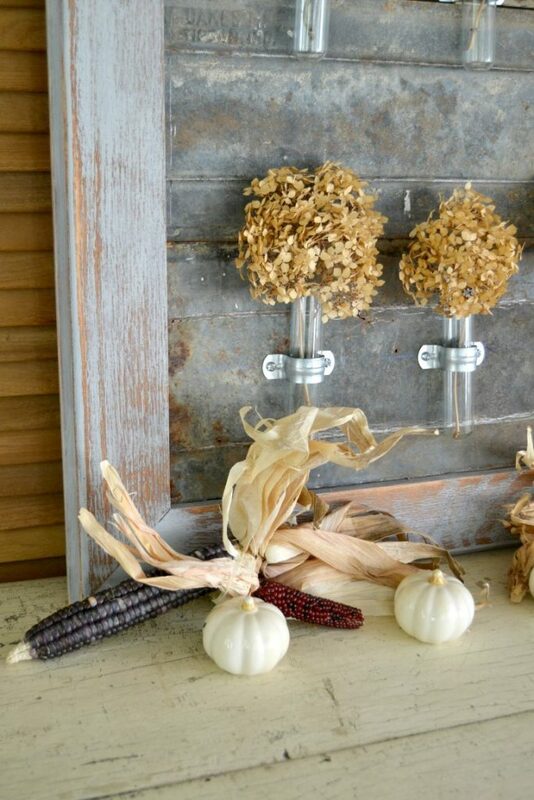 Super rustic and I love that you can use it all year long! Love this idea. 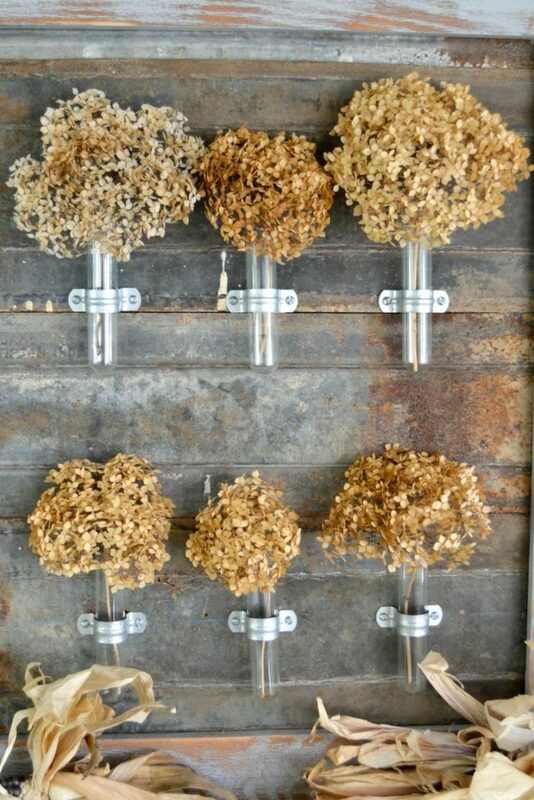 I am a big fan of hydrangeas and the test tube vases are adorable. So inspiring!! What a creative idea, I LOVE this!!! That can be used all year round! 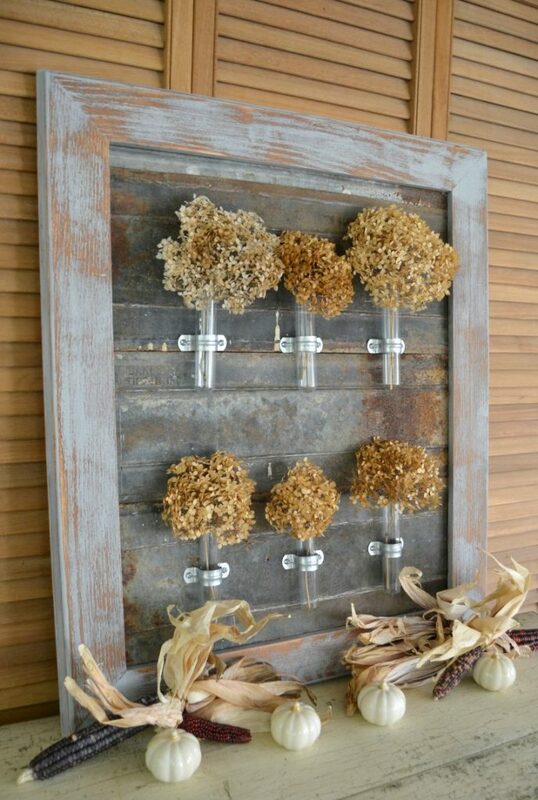 What fun adding different flowers or greens for winter! I am excited to decorate it for different seasons! LOVE love love this !!! such artistic and brilliant ways to bring together all the pieces! beautiful!! Thank you so much for stopping by Ananda! 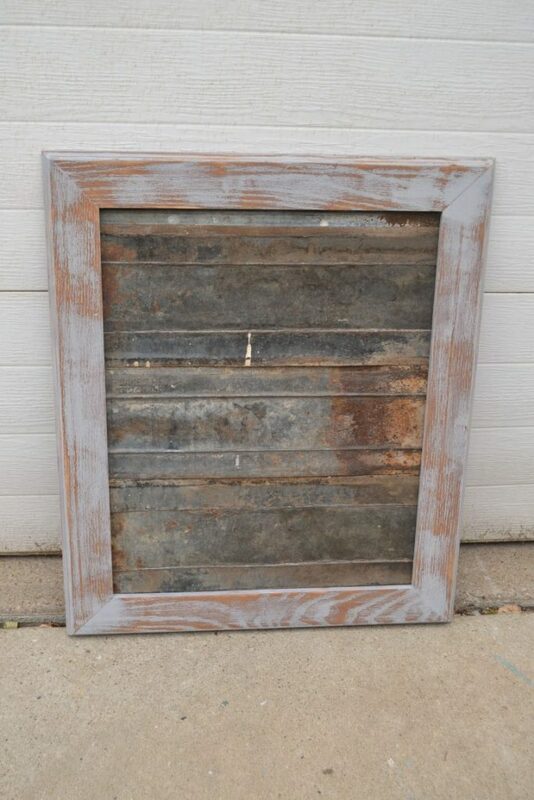 Ooooooh, I love the patina on the tin and framing it idea. Adding test tubes is very clever Lindsay. I can see how much fun it’s going to be decorating it for all the seasons. Looking forward to seeing how you decorate it for the holidays! Pinninh. That is so cool! I never would have thought of using the chicken feeder for the backing! Sooo pretty Love this upcycle! Thanks for linking up to Merry Monday! Sharing on FB Wednesday! Have a great week! Your welcome Bre! Thank you! Lindsay what I love about your Fall DIy is that it is truly one of a kind. It is not a replication or copycat of anything I have ever seen. I love the rustic look combined with a bit of beauty from the flowers. Stunning! I am in love with the chicken feeder metal background!! It doesn’t get any better than that! And those test tubes just give it the perfect rustic industrial touch. I LOVE it! Love everything about this, so creative! Lindsay, this is SO neat and innovative! I thought for sure the background was wood! Thanks Emily. I just love it too. 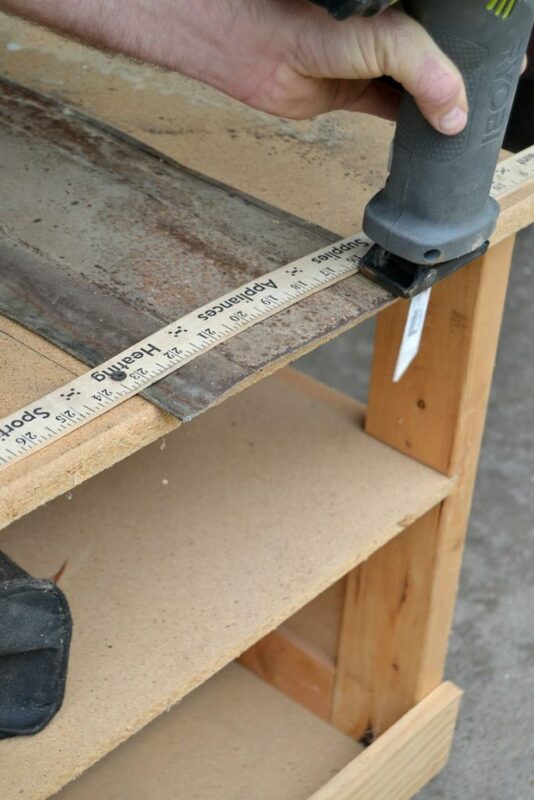 Repurposed projects are the best! Thank you so much! I linked up with ya!!! Ok this is amazing. 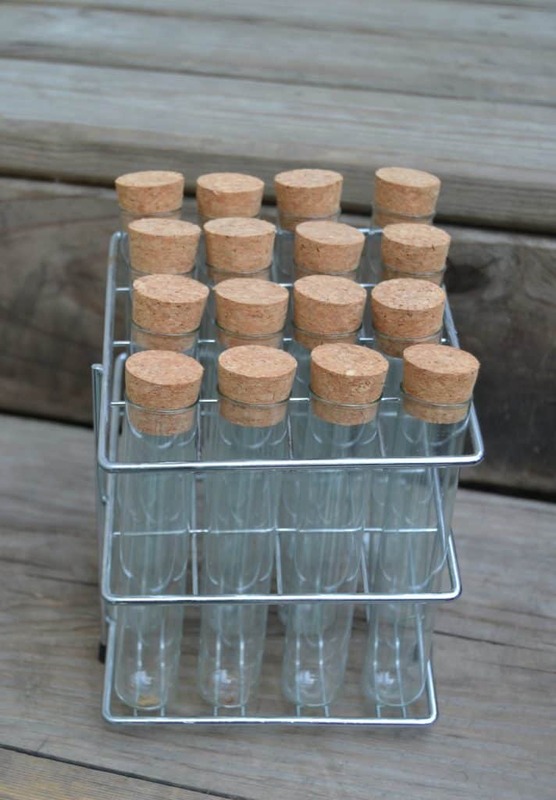 I have craft upcycling envy now! Wonderful job! What a great and fun idea! Great job! What a terrific idea! I love that you can use it all year round too. It will look so pretty in the spring with some fresh florals! Thank you for sharing at Create • Share • Inspire! We hope to see you again this week. I am excited to decorate it throughout the year! Thanks Alicia! This is so so beautiful! Thank you so much for stopping by and sharing at Dream. Create. Inspire. Link! I am pinning your idea! I hope we’ll see you there again this week! This is amazing! I love it! I can’t believe it started from what it did. Thanks so much for linking up with The Alder Collective! Hope you’ll join us again this week! Have an awesome night! What a gorgeous project. 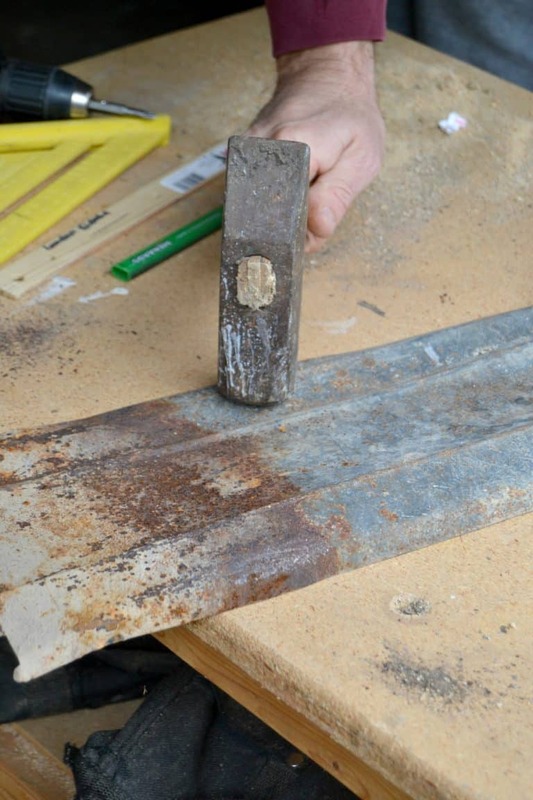 I love how you’ve used the metal, although I think it would be outside my diy skills. I’m feeling confident I could probably manage some other sort of background though, I think my home NEEDS a frame with little test tubes of flowers in it!